NYC, 04/23/2019, 12:00PM. 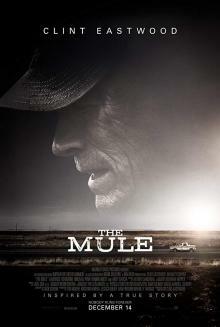 The Mule (2018): Crime Drama By And With Clint Eastwood. 116 min. Director: Clint Eastwood. Starring Clint Eastwood, Patrick L. Reyes, Cesar De León. The Mule has grossed $103.8 million in the United States and Canada, and $62.9 million in other territories, for a total worldwide gross of $166.7 million, against a production budget of $50 million.